Tonight’s a very sad night for me, as I’m sure it is for many of you. I still feel more than a little shocked at the news that Steve Jobs has died. I still feel like my thoughts are cloudy and my words are no better. The death of Steve Jobs feels sad on a general level – the loss of a great, legendary man, a genuine visionary who has had massive impact on so many people’s lives, at such a young age. A great loss for Apple, for the entire tech industry, and for the world. It also feels sad on a personal level, deeply so. I’ve spent the better part of the last five years using, being fascinated by, and writing about products that he was instrumental in creating. Our team over at iSource has decided to halt normal service tomorrow and only make minimal posts as brief tributes to Jobs, no standard coverage of other topics, partly due to our sadness at this loss and partly out of respect for the man we’ve lost. I will of course be taking the same approach here. Consider it our almost minute of silence. The image above is one of the ways I most like remembering Jobs. 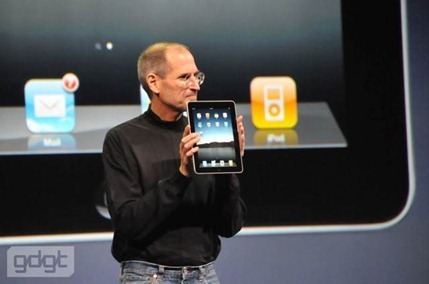 Presenting the original iPad, another (perhaps his most) game-changing device. He described it as ‘magical and revolutionary’. For some that was over the top hyperbole – for me, the device has lived up to those words. And for me those words are very apt to describe Jobs himself as well. My daughter walked in the room while I was watching the early TV news coverage of his death. I was still feeling shocked and had very few clear thoughts and even fewer words. I didn’t need to say much though. She uses a Mac Mini at home and in the Computer Labs at her school. She has an iPod Touch that she uses tons. She shares an iPad with her mom and loves it. She has heard me talk about Steve Jobs before. I told her that he was a great man, a man that she will learn more about in history and other classes as she moves to higher grades in school, a man who has had a big impact on our world, and will be sorely missed by so many of us. I’ll get back to posting normally on Friday. In the meantime, if you’d like to share any of your thoughts and favorite memories of Steve Jobs please do in the comments. Such a profound loss for us all. Thank you, Patrick, for your gut-level post. I’ve been reading so many superficial sentiments tonight, which sound like greeting cards. You speak from a place of personal loss that I also feel. Somehow, as my iPhone and iPad have become my best friends, I have developed a connection to Steve Jobs. Didn’t even realize it until now. Always intrigued by his words and ideas. Always admired his brilliance. You said it perfectly — Magical and Revolutionary. Thank you for sharing your thoughts, and giving me the place to share mine. With the release of the iPod, iPhone and iPad, to me, he simply ‘changed the game’. Everyone else is still, and will always be, trying to catch up. I knew where I needed to go for a heartfelt tribute to Steve Jobs, and I was not disappointed. Even an inveterate “Luddite” like me understands that few people have ever lived whose life work has had such an impact on mankind, and, more importantly, such a positive impact, as Steve Jobs. He singlehandedly changed the way people all over the planet live every day of their lives: how they learn, teach, play, read, write, and experience every form of entertainment and communication. And while I know that you are profoundly saddened by his passing, you should take great comfort in the undeniable fact that his life’s work will continue to powerfully impact, and elevate in every sense of the word, the lives of all of us.